Lay the tortillas in a single layer, cover with a dish towel or napkin and let them dry for about a half hour (depending on their moistness) until they are leathery—this will enable them to crisp thoroughly on the grill. Meanwhile, in a food processor, combine the egg yolks and lime juice and pulse until blended. With the machine running, slowly drizzle in the oil (the yolks and oil should emulsify and become creamy). Turn the machine off, add the avocado, green chile and cilantro. Let the processor run for another 20 seconds to ensure the additional ingredients are incorporated. You may have to stop the machine once or twice to scrape down the sides. Taste and season with salt, usually about 1 teaspoon. Scrape the mayonnaise into a bowl and set aside. In a large (10-inch) skillet set over medium heat, cook the bacon, stirring occasionally, until crispy, about 10 minutes. Remove the bacon and drain on a paper towel. Strain the fat into a small bowl—you need ¼ cup bacon fat (if you’re lacking, add vegetable oil to bring it to that quantity). When the tortillas are ready, turn on a gas grill to medium or light a charcoal fire and let the coals burn until medium hot and covered with grey ash. When you’re ready to serve, lay several tortillas on the grill and turn every 20 seconds or so until they're golden brown and crasker-crisp; this will take 5 to 10 minutes depending on the heat of your fire. Brush the top of each tortilla generously with the bacon fat or oil and let the tortillas crisp a little longer, then remove them to a serving platter. Spread on some spicy avocado mayo and top with a portion of the tomatoes. 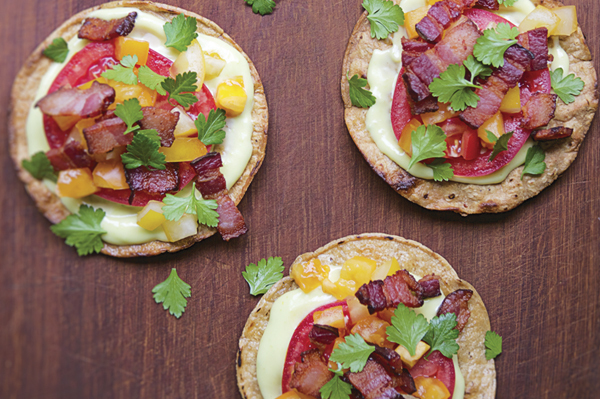 Sprinkle each tostada with about a tablespoon of bacon, garnish with cilantro leaves and immediately serve to your guests while you make the next round. I just made this dish. It fabulous…I had to substitute with regular tomatoes.. but I was very delish!!! so it makes 12 tostadas but the recipe calls for two dozen tortillas. Whats up with that? That was an error on our part! Great catch! Thank you! Omg Rick these are so delious I made these this weekend for my family Labor Day bbq and everyone liked them a lot my dad even ate 3 and he doesn’t eat more than one maybe to tacos oh yea he also had one of your steak tacos too I made!!!!! what is the nutritional value of this recipe? Found this in More Mexican Everyday and have made it for three meals in a row (yes, including breakfast). 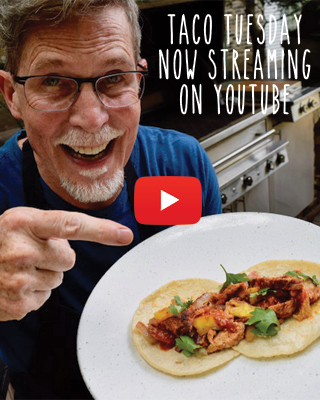 How brilliant to put bacon on tacos! Bravo!!! There are very few Mexican restaurants in Tokyo so it’s best to cook at home. Thrilled to add this to my limited repertoire.